Faces don’t come much more repulsive than those pulled by Fabio Aru as he rode away from everyone on the final climb of stage 19. I’m not being cruel (because he does have a bit of a funny face anyway), it was just one of those rides where self-consciousness is abandoned in favour of wide mouthed dribbling. Laurens Ten Dam is probably the man who sets the standard in this particular field. By the end of a time trial, Laurens often boasts a thick layer of spittle which laminates his entire beard. Without exhibiting quite so much fluid loss, Aru did however add to this picture by setting his mouth into a position which brought to mind no less an individual than Beaker from the Muppets. 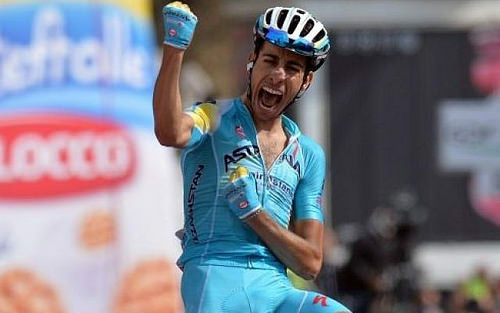 Aru owed his success to the promise of alternating attacks on the final climb from himself and team-mate Mikel Landa. Alberto Contador followed his and Landa’s first attempts and then thought ‘sod it’. The race leader has enough of a buffer that he could watch Aru ride away without too much concern. The Spaniard finished alongside Landa 1m18s down which means Aru is back in second overall, albeit 4m37 behind. Yes, I finally got on the Giro mailing list in time for the last few days of the race. No matter. That gives us three whole dishes to ponder. Today’s was fonduta alla valdostana. It’s basically a type of fondue for people who think a bucket of cheese simply isn’t rich enough. Milk, butter and eggs are added and then they grate truffle on top for good measure. Actually, sod it, let’s have yesterday’s as well. Ris e lait e castagni bianchi is a soup where rice and chestnuts are cooked in milk. Sounds like the kind of desperate concoction an impoverished student might come up with, but in Italy it’s doubtless delicious. Loads of dicking about on the flat around Turin and then suddenly it’s up to Sestriere on an unpaved gravel road that averages about 9% – a horrendously jarring tonal shift. Contador hasn’t won a stage yet. He’ll want to and this is his last chance.